The following are our lionesses (queens, moms). 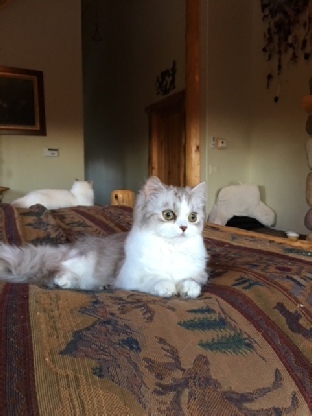 Since we are a small cattery to ensure good socialization of our cats, we will have a limited number of females, although they will outnumber our boy. At this time, we have only two active girls in our breeding program. Josie and Katy do not breed, but are still a part of our family. We do not re-home our cats after they retire. This is their home and we are their forever family. 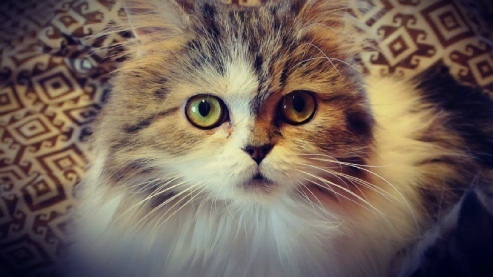 Bing is an adorable long hair standard Minuet who loves being a mom. She begs for treats and is my husband’s companion. She is inquisitive and highly intelligent, and has shown that she can plan strategies to problem solve. One must always be on their toes around her, and she is a constant source of entertainment. Bing can eat all day and not become overweight. She has a fast metabolism. Click here to see Bing’s past litters. Josie bred only once, in 2016, and had a single litter, then had pyometra. She was treated for the infection but never had another litter. She has not been spayed yet, but we will–once my husband realizes that she cannot carry a litter. Click here to see Josie’s past litters. This picture was taken by Malkhaz, one of Milo’s new parents, when he and his wife, Mandy, came by to see Milo. He graciously allowed me to use it on the website. Thanks, Malkhaz. It’s a beautiful picture. Ellie is definitely attached to my hip. She chose me to be her parent, not the other way around. She is an amazing little doll. She immediately bonded to my husband and me as her new family and loves to fall asleep on my chest for naps and nighttime. There isn’t any place I go that she doesn’t want to follow me to. Ellie has been shown in TICA, both as a kitten and an adult, starting in 2017. She is currently a quad-grand champion. Click here to see Ellie’s past litters. Sydney is a darling, kooky little girl who is too young to be bred right now but is our last cat. We have reached our limit and are happy with our cats. Sydney will hopefully become a good mom when she grows up. She is Katy’s replacement and I’m thrilled that she carries a lot of what Katy does, since she can produce blue-eyed babies for us. Sydney will be showing in TICA, starting in February 2019.